Sarah Kilgallon, of Watertown, accepted a date from worshippers Yusra Mukhtar and Nafisa Bilal outside the Islamic Society of Boston Cultural Center in Boston in February. A gathering of the Massachusetts Board of Rabbis last month featured a pair of unusual speakers: the leaders of Boston’s largest mosque. Shaykh Yasir Fahmy told more than 50 rabbis about growing up in New Jersey and studying in Jordan and Egypt. He taught a celebrated religious text about the angel Jabril (Gabriel) and the Prophet Mohammed. Yusufi Vali, the mosque’s executive director, spoke about the anxiety many Muslims feel in the current political environment. In many ways, it’s an uncommonly dark moment in American religious history, with frequent news of yet another bomb threat, cemetery desecration, shooting, or arson targeting Muslims or Jews. 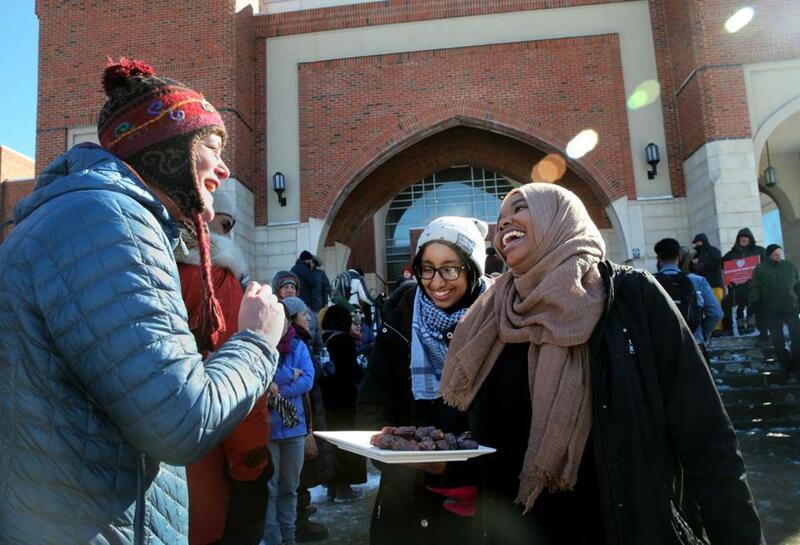 But the fear and uncertainty have sparked an intense period of relationship-building between the two faiths: In Boston and across the country, a winter of persecution has brought a new warmth and vitality to Muslim-Jewish relationships. “In this moment of crisis for both communities . . . there’s been a clear sense that we need to be able to stand together where we can,” said Jeremy Burton, director of the Jewish Community Relations Council of Greater Boston. Some of these demonstrations of good will are a spontaneous reaction to the attacks on both communities. But it’s also evidence that years spent cultivating relationships are bearing fruit. “It underscores how important it is to work together all the time, and in so doing, to create relationships that allow us to support each other,” said Rabbi Victor Reinstein of Nehar Shalom Community Synagogue in Jamaica Plain, who nine years ago helped start a small study group of Jewish and Muslim religious leaders called “Building Bridges through Learning” that has quietly established foundational bonds. Expressions of concern and commitment to religious freedom have abounded in recent months. At the national level, a Muslim fund-raising effort to repair vandalized Jewish cemeteries has raised more than $160,000. Jewish groups such as HIAS, a Jewish refugee resettlement agency, have been at the forefront of challenging the Trump administration’s limitations on refugees and immigrants from Muslim-majority countries. Last month, Jewish descendants of Holocaust refugees and survivors led a group of interfaith and secular supporters in making a human “chain of peace” around the Islamic Society of Boston Cultural Center in Roxbury during the Friday midday prayer. Moved, Muslims brought hot coffee and dates to the symbolic protectors as they stood in the frigid air. “It was just — beauty,” Vali said. Rabbi Or Rose, director of the Miller Center for Interreligious Learning and Leadership at Hebrew College, and a colleague at the Jewish Theological Seminary in New York launched a webinar series this month called “Understanding Islam” for rabbinical students across the country. Rose said the effort was spurred by the highly polarized public discourse on Islam and an “urgent sense of responsibility” he and his colleague felt to respond with learning and conversation. And amid the torrent of bomb threats targeting Jewish institutions last month, the Jewish Community Centers of Greater Boston received a letter from Malik Khan, the president of the Islamic Center of Boston in Wayland. “We must stand together against the undercurrent of hate,” Khan wrote, bringing some community center board members to tears when his note was read aloud at a recent meeting. The gestures are personal as well as institutional. Celene Ibrahim, who teaches at Hebrew College and is completing doctoral work at Brandeis University, said her Jewish colleagues were among the first to reach out to her as anti-Muslim rhetoric escalated during the presidential campaign, sharing stories of their own families’ history in Europe in the 1930s and 1940s. “Now, I find it's me who is writing letters to them saying, ‘I stand with you in solidarity and condemn these hateful acts and this anti-Semitism,’ ” said Ibrahim, who is also the Muslim chaplain at Tufts University. To be sure, divisions remain, both between the two communities and within each of them, especially on issues related to the Israeli-Palestinian conflict. And the communities’ leading civil rights organizations, the Anti-Defamation League and the Council on American-Islamic Relations, do not have a relationship, even though each has spoken separately against attacks on both Jews and Muslims. Still, the progress is clear. A decade ago, many Jewish leaders had concerns or unanswered questions about whether the Islamic Society of Boston had ties to extremism, as criticsinsisted, despite Muslim leaders’ protests to the contrary. When the society’s Roxbury mosque and cultural center opened with great fanfare in 2009, Mayor Thomas M. Menino and a number of dignitaries attended, but the leaders of most of the city’s major Jewish organizations did not. An interfaith service was held at the Islamic Society of Boston Cultural Center in December 2016. Vali has played a crucial role in building the cultural center’s relationships with Jewish institutions. 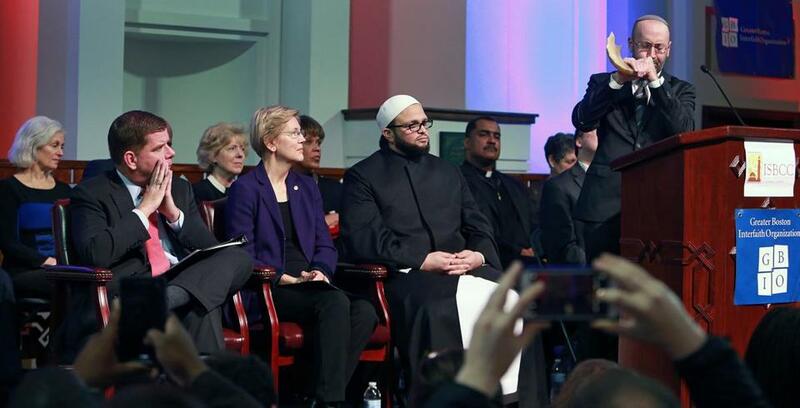 He grew to know some rabbis and Jewish lay leaders through his work as a community organizer for the Greater Boston Interfaith Organization before assuming leadership of the mosque in 2012. “ ‘Rather than engage with the tension directly,’ [we said], ‘let’s start something to offer a different model, a different way,’ ” Reinstein said. The Greater Boston Interfaith Organization has fostered important bonds, as have more intimate visits and gatherings, such as small-group exchanges among congregants. When Fahmy, the cultural center’s senior imam, arrived in Boston in 2015, the board of rabbis reached out to welcome him; it then sent a delegation to meet with him last summer. That laid the groundwork for the mosque leaders’ address to the board last month — a turning point, said Rabbi Andrew Vogel of Brookline’s Temple Sinai, who noted the board of rabbis is “a very big umbrella” spanning much of the non-Orthodox Jewish community. “It represents the mainstreaming of the relationship” between the Jewish community and the cultural center, Vogel said. Rabbi David Lerner, president of the board of rabbis, said the leadership of Vali and Fahmy, “who I now feel I know personally,” has made a difference, as has the changed environment that has emphasized the communities’ common experiences and concerns as religious minorities. “We really want to build a bridge between the communities; it’s so vital in our world that is increasingly fractured and fearful,” he said. Last fall, when a synagogue in Stoughton hosted an event featuring three nationally known critics of Islam, many rabbis — including Lerner — were among some 100 interfaith leaders who signed a letter urging that the invitation be revoked. Temple Israel of Boston, the city’s largest Reform synagogue, has developed especially strong ties with the cultural center over many years. Recently, when a family of Syrian refugees the congregation is sponsoring wanted to visit a mosque, the temple’s senior rabbi, Elaine Zecher, texted Vali that her congregants were on their way with the Syrian newcomers. Upon entering “they were swarmed with people welcoming them,” Zecher said. “And then at the end of the prayers, the shaykh, in Arabic and in English, spoke about ‘our friends at Temple Israel are helping to settle this family’ and he introduced them. 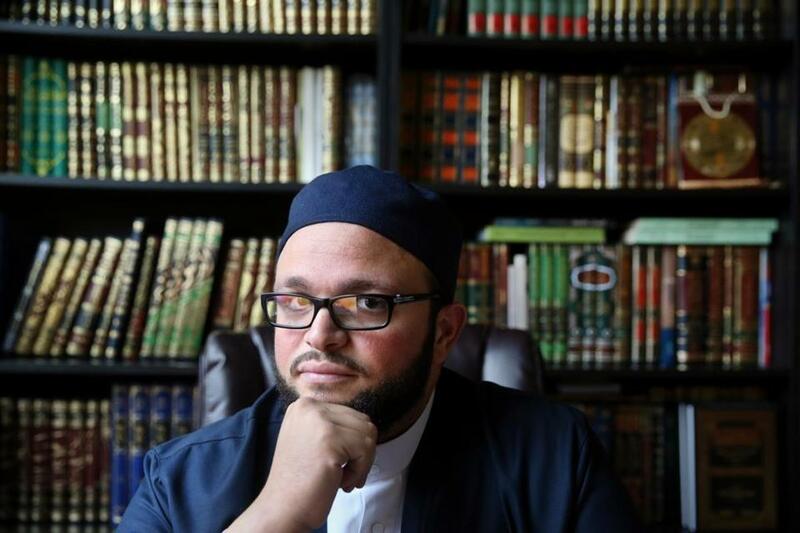 Shaykh Yasir Fahmy posed for a portrait in his office at the Islamic Society of Boston Cultural Center.